September's print giveaway starts now. 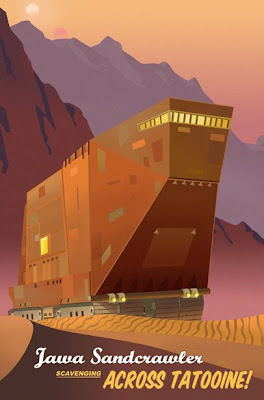 This is an artist's proof of the licensed Star Wars travel poster to Tatooine. 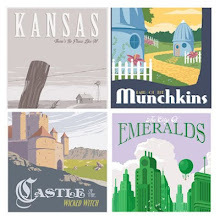 The regular run of 150 has sold out and this is one of my last APs. It is the same size and quality as the regular run and comes with a Certificate of Authenticity from Lucasfilm and Acme Archives Limited. Size is 13 by 19 inches, Giclee print on paper. 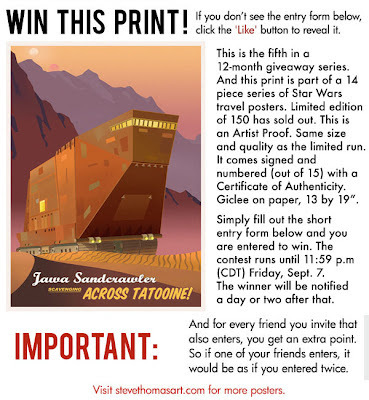 This will be the only time I give one of the Star Wars travel prints away, so enter and invite friends to enter. Remember, for every friend you invite that enters, you get an extra point which increases your odds of winning. Here is the link to enter. If you don't see the entry form at the bottom, click the "Like" button. The giveaway ends Friday, Sept. 7 at 11:59 pm Central time. Don't forget I have my last Mos Eisley racing print up on ebay until Friday as well.